on Sunday afternoon in downtown San Antonio. Flat Wesley went with me to a conference on Henri Nouwen, a great (really great) spiritual writer. Wesley began the Methodist movement in England in the 1700s, while Nouwen started his journey in Holland in the 1930s where he became a Catholic priest. They would have had much in common. Congratulations, Mike and Ginger! You are loved by many. 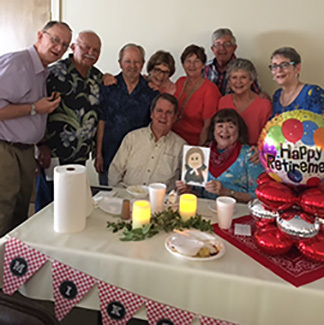 The Bucks, Daggs, Foncannons, and McAdens took Flat Wesley to Hunt United Methodist Church for Mike and Ginger Cave's retirement dinner. Another view of Vancouver, Canada. In Lindale Texas, home of Miranda Lambert & her shop, The Pink Pistol. Fun place! And guess what? Flat Wesley liked the shop too. Bar Harbor, Maine with the Hosack's. On the road to the Prichard Family Reunion in Crossville, Tennessee. Jack's Island, New Bern, Nc with the Limrick's. Lynda Martinez, her granddaughters and Flat Wesley went to Silver Tree to deliver flowers to the residences. in Port Aransas with Bob and Alison Buck and niece Ruthie Brown. Playing cards in Peachtree city, GA! Flat Wesley riding my uncle's famous statue on the Ingram-Fletcher family's Grasshopper Hill Farm outside of Flint TX (south of Tyler) where he had a fantastic 4th of July blessing so many folks and animals galore! Another view of the Coliseum.